From Studio, you can navigate to Advanced Settings from the Setting drop down menu. The first setting you see here is your Advanced Module List. 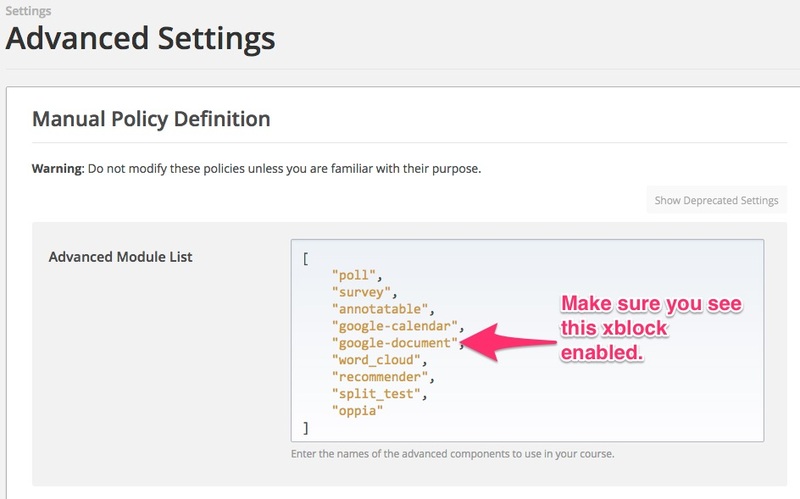 These are the XBlocks currently installed and enabled in your course. Make sure your list includes "google-document". If you don't see the XBlock enabled, as long as it's installed on your server, you should be able to simply type "google-document", to enable it. Make sure you save your changes. Navigate to a new unit and instantiate an "Advanced" component. 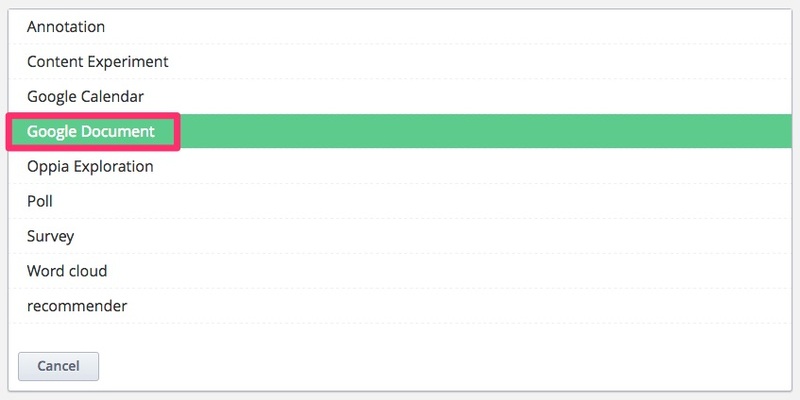 If you don't see the green Advanced component tile, it probably means Xlocks aren't currently installed on your server. Contact Appsembler or your SysAdmin to set this up for you. 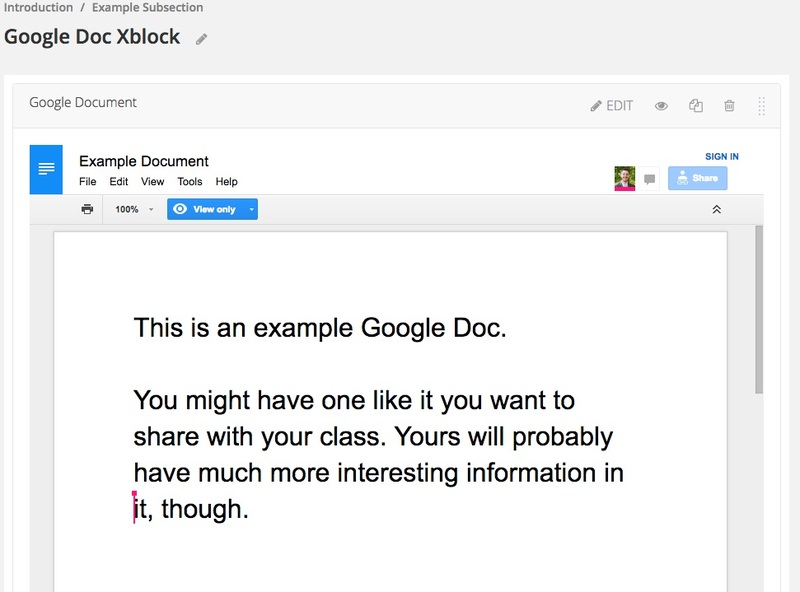 By default, the Google Document Xblock is pre-populated with a Google Presentation giving a brief overview of how it works. In order to add your own document, click the Edit button at the top right hand corner of the component. From here, you can either replace the entire embed code of your doc, or simply replace the link in between quotes after "src=". Then save your changes. And just like that, instant Google Doc! Note: the sharing settings on your Google Doc should not require a sign in to a specific organization. Because Google can't tell who is seeing the embedded doc, it simply won't show up. 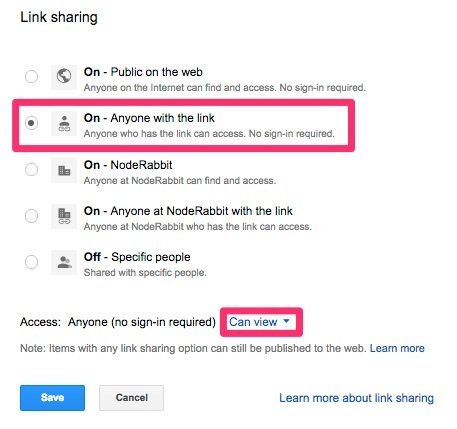 The best option is to set your Sharing preferences to "Anyone with the link." And if you don't want anyone changing the info within, make sure permissions are set to View Only.